Melissa Hutchison has been earning her keep as a Voice Over actress for almost a decade. A Bay Area Local since 1989, Melissa divides her work between San Francisco and Los Angeles. Her resume includes a wide variety of work, ranging from TV and Radio commercials, to children's interactive toys, animation, and video games. Melissa's most current claim to fame is being the voice of Clementine, From Telltale games, The Walking Dead. This role just earned her a Spike TV VGA for best performance by a female, and the game itself has pulled in over 55 Game of The Year awards for 2012. 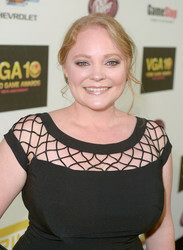 When not fighting zombies, Melissa has also voiced for League of Legends (Ashe), Deadly Premonition (Anna Graham and Sallie Graham), Sonic and the Black Knight (Merlina), Bakugan: Defenders of the Core (Marucho), Telltales Back to the Future (Trixie Trotter) Telltales Sam and Max (Stinky), Death Jr. 2: Root of Evil (Pandora), and the list goes on! Melissa also got to dip her acting chops into the world of Anime, by doing the voice of Chise, in Saikano: She the Ultimate Weapon, back in 2002. Currently Melissa is working on an animated series, set to be released in 2014, called the Space Racers.